Mandeville, LA – Our sixty-seventh show debuts on Wednesday, March 15, at 8:00 PM Eastern. Rebroadcasts will take place according to the Crusade Channel programming schedule (note:all times listed are Central time). The topic is Unexpected Apologetics: Faith and Good Works. The show is a consideration of the faith-works debate between Catholics and Protestants within the deeper framework of the doctrine of grace, merit, and free will. Faith and Good Works — by Brother André Marie at catholicism.org. The Epistle of Straw — by Brother André Marie at catholicism.org. Catholics, Protestants, Grace, and the Spiritual Life — by Brother André Marie at catholicism.org. Grace Perfects Nature — by Brother André Marie at catholicism.org. ‘Freemen Established Under Grace’ — by Brother André Marie at catholicism.org. Are the Works of Mercy Ever Obligatory? — by Brother André Marie at catholicism.org. Are the Works of Mercy a Matter of Justice? — by Brother André Marie at catholicism.org. 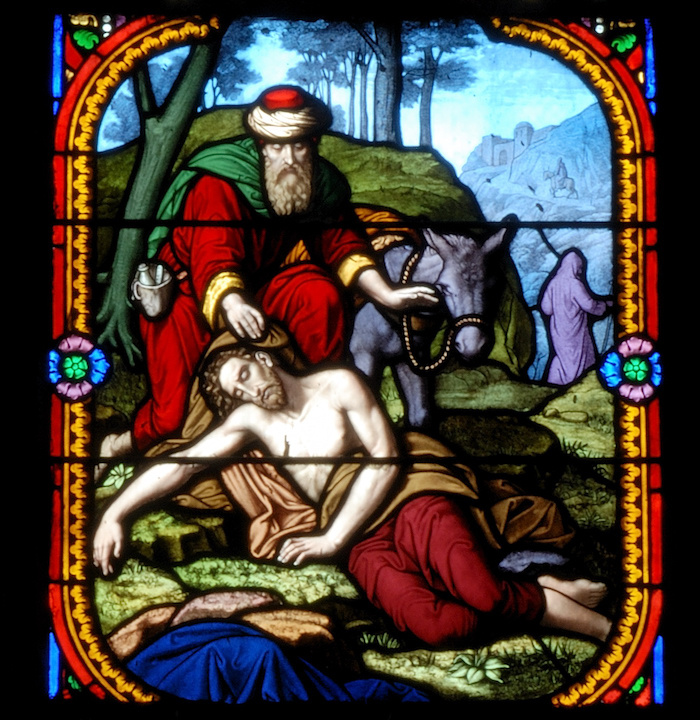 The Parable of the Good Samaritan, detail of stained glass window in the Church of Saint-Eutrope in Clermont-Ferrand, photo by Romary (Own work) [GFDL, CC-BY-SA-3.0 or CC BY-SA 2.0 fr], via Wikimedia Commons. Image at top is The Seven Corporal Works of Mercy by the Master of Alkmaar (1504), Rijksmuseum, Amsterdam, the Netherlands, Wikipedia.